In 2018, the majority of successful businesses are past the initial phase of introducing their Customer Experience programs. In fact, a recent study showed that 72% of business rank CX in their top 3 business priorities and a further study showed that by 2020 CX will outrank products and services as the main point of differentiation for businesses. Looking forward, the Net Promoter Score needle will be increasingly difficult to move – the low hanging CX fruit has been picked, and customer expectations keep growing. That’s why organizations are now turning to Conversation Analytics to tap into the richest unstructured data source – voice. It is now easier than ever to incorporate voice channels in your data mix and businesses utilizing speech analytics significantly outperform others. Conversation Analytics automates and enhances call monitoring, delivering actionable insights that improve customer experience, business performance, employee engagement and risk management. It helps businesses listen better. It catches every happy or disgruntled customer, every conversation with growing negative and positive emotion and dissects them to discover common root causes. Historically, customer experience KPIs such as NPS were based on structured data derived from post-call surveys and biannual market research. Now, businesses are increasingly turning to unstructured voice-based data, to drill into their customer’s emotion, sentiment and verbatim opinions. In fact, we see a global shift away from relying heavily on NPS results for decision making. Thanks to the advanced Natural Language Processing and A.I in our platform, the scale of research that would be unthinkable just a few years ago, now is possible allowing businesses to discover patterns hidden in thousands of call recordings. During a 10-minute phone call, businesses usually focus on the post-call surveys for data and customer insights. Business leaders are measuring NPS and making a lot of important decisions based on a small snapshot of data at the end of the call. 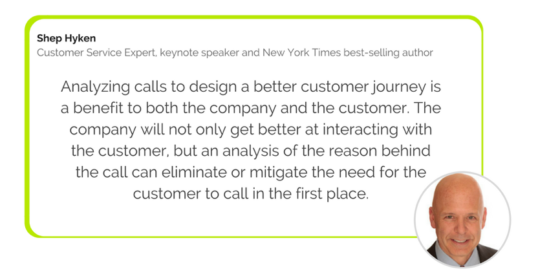 Most businesses are ignoring the gold mine of information that happens during the actual conversation between the customer and agent. The real beauty of Conversation Analytics is that nothing gets past it. What makes customers unhappy? It’s rarely the agents. Most often the culprits lowering the NPS and endangering compliance are broken processes requiring substantial customer effort, misguided offers, and unresolved issues. All these can be brought to light with a bit of smart technology. 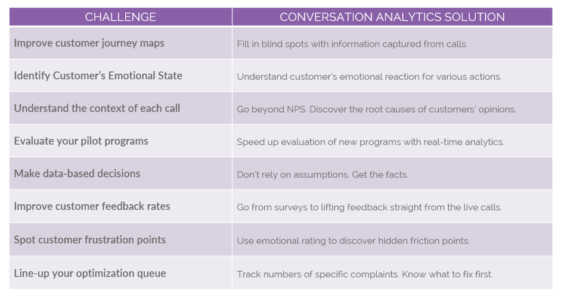 Want to learn more about Conversation Analytics? Visit Call Journey on the AppFoundry Marketplace or register your interest online for a FREE Conversation Analytics Trial! This blog post was co-authored by Paul Humphrey, CEO at Call Journey. For the past 30 years, Paul has been helping businesses find solutions to business pains related to workforce optimization, sales processes and lately, growing data requirements. Recently, he moved to Call Journey, an innovative tech startup using Artificial Intelligence to analyze phone conversations. Since then, he transformed Call Journey into an official partner of one of the largest market players. Paul is a recognized thought leader in data-driven revenue protection and growth, customer experience, and operational efficiency. He is a regular presenter at global service and sales thought leadership conferences and has a passion for execution and opportunity realization.